We have a large Vietnamese community in New Orleans and numerous Vietnamese restaurants. My 2 favorite places for Banh Mi are Pho Tau Bay (113 Westbank Expy # C, Gretna, LA‎ – (504) 368-9846‎) on the west Bank and Dong Phuong (14207 Chef Menteur Hwy, New Orleans, LA‎ – (504) 254-0296‎), which has a bakery that makes the baguettes used by most of our Vietnamese restaurants. Also, there is Eat Well, a convenience store at 2700 Canal St, which has wonderful Vietnamese take away. Anchau Market on Capital Blvd in Raleigh, NC has a Banh Mi stand where you can pick them up for $2.50. I believe down the street the restaurant Pho Cali also offers them. BEST BAHN MI EVER EATEN CAME FROM THE HONG KONG MARKET. LOCATED ON BEHRMAN HWY. IN CITY OF GRETNA. I am somewhat of a newcomer to Banh Mi having heard of them for years but never trying them – until about 1 year ago. Here in Atlanta there is a corridor of ethnic restaurants along Buford Highway – a little northeast of the city. The two most well known – and for good reason – Banh Mi spots in Atlanta are probably Lee’s Bakery and Quoc Huong Banh Mi Fast Food. Some people are very pro one place over the other but I think both are great, with a few differences. At Quoc Huong (5150 Buford Hwy NE Atlanta, GA 30340), every time I have been in I have been the sole Caucasian in the restaurant. The tables are always 1/2 full at off times, overflowing at meal times with a wide variety of dished being served. but its always sandwiches for me. Here the rolls are crispier on the ends – maybe they toast them a bit. I prefer the slightly softer bread at Lees – these crumble all over you when eating. The flavor of the roast pork is a little better here but the pork sandwich always comes with too much butter/mayo and no pate. The vege (rao) is great here, but I think they can be a little skimpy with the Daikon which is my favorite. Really cant go wrong either place. Banh Mi comes to Birmingham! WOW! I had never heard of these sandwiches before yesterday. My husband called me up and asked if I wanted to meet him for lunch at a newly opened Vietnamese restaurant close to our apartment. I agreed and he suggested one of their sandwiches. The menu was pretty much in Vietnamese, so he knew exactly where these sandwiches were listed and ordered for us. I was skeptical because my “ethnic” food tastes are usually limited to Taco Bell. This sandwich was amazing! It was a perfect blend of pork, dill sauce, carrots and cucumbers! I don’t like cucumbers, but they blended so well with the rest of the flavors that I ate it all anyway. Absolutely THE best thing I have tasted in a long time. And it’s only $3.50 for a pretty nice sized sandwich! Must try if you are close to Birmingham. The restaurant is Saigon Noodle House in the Target shopping center off Hwy 280. A lot of these shops are located in the Mills50 District [http://www.mills50.org]. Enjoy! Best Bahn Mi is Dong Phuong…Chef Menteur Hghwy, New Orleans East…Great place…There is also a place a block away from Dong Phuong by Pho Bang that has a delicious Bahn Mi. I was very unimpressed with Pho Tau Bay’s sandwich. If there is ANY othere suggestions in South Louisiana I would love to hear them. Happy eating! Bahn Mi on the Mississippi Gulf Coast can be found at Le Bakery, 280 Oak Street, Biloxi, MS 39530. Excellent choices of proteins all with the traditioal fresh baked bread and pickled daikon and carrot with cilantro. Everythin I have tried incuding the pastries are awesome. Vietnamese owned and operated. Pho Que Huong in the Homewood area off of Greensprings Hwy in Birmingham also carried banh mi. This restaurant for years was Birmingham’s only Vietnamese restaurant. However, Saigon has offered fierce competition, and the quality of Pho Que Huong has gone downhill. The last banh mi I purchased there, close to a year ago, was a disappointment. The bread was stale, and the fillings were very sparse. Banh Mi Sao Mai on Chef Menteur is a good one to try! Banh Mi at Viet My Super Market is really good to try if you are in the New Orleans East area. The location is on 4656 Alcee Fortier Blvd., New Orleans, LA 70129. Their Duc Biet (combination) sandwich is a great and you get a lot of meat and fixings for $3!!! St. Petersburg, FL: Mekong on US 19 (34th), just south of 54th Ave. – the sandwich is served on the appetizer menu and served crispy and warm – a delicious way to start a meal by splitting one! Periodically we get some great Banh Mi down here in Lexington. A chef comes in to the Institute 193, prepares and sells Banh Mi to support the gallery. I’m hoping they do another fundraiser again real soon so I can stock up. Those were some delicious sandwiches! When in Charlotte go to Zen Asian Market on Park Road. The Bahn Mi there is really, really great. I am lucky we have them now here in Charlotte, NC. I’m pretty much a bahn mi amature, but they’re quickly moving up on my list of favorite sandwiches. I generally have mine at Thanh Thanh in Gretna, Louisiana–just across the Mississippi River from New Orleans. I found this great banh mi place at the Yellow Green Farmer’s Market in Hollywood, Florida! It has so much flavor and when you eat it, you know what your eating. They also have AWESOME boba tea!!! Its simple to just stop by and get your craving filled! Lee’s Pho in the Assi Market Food Court on Pleasant Hill Road in Duluth has 6 kinds of Bahn Mi. Lee’s is an offshoot of Lee’s Bakery on Buford Highway. I eat the Beef Bahn Mi at least once a week. Anh Hong has a fantastic banh mi sandwich, the grilled pork is the best!!! I’ve heard some pretty darn good things about Sakaya Kitchen in mid town Miami. Check out Maba Grill for in Athens, GA!!! http://www.mabagrill.com They even have B&B Tuesday nights (BANH MI & BEER) FOR ONLY $5 🙂 Can’t beat that!!! Orlando, FL – my favorite bahn mi in Orlando ar from Ahn Hong restaurant on the corner of Mills Ave and Colonial Drive, downtown Orlando in the same neighborhood as hte others listed by Thuan. I have to second the Zen Market in Charlotte. Very good, cheap and quick. Do all of your shopping in the couple of minutes it takes for them to make your order. Like Jim says, there’s a good Banh mi place in the Assi shopping center in the food court (on Pleasant Hill Road, in Duluth) and there’s another place to get a Banh mi down a little farther on the same road in a new asian shopping center called Great Wall. Both had a tasty sandwich, but the place in Assi seemed to have more meat in their sandwich. I have yet to try Bahn Mi at any restaurant but Lee’s Bakery on Buford Hwy although I have eaten Other Vietnamese fare at other locations. Lee’s version of this sandwich is delicious. The ingredients are fresh and crisp and keeps me making the drive to get them. 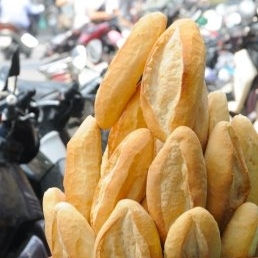 Economically, you can’t ask for more…a six inch crusty baguette for a low low $2.50 AND no tax. Have only had from Hong Kong Market on west bank because they are so very, very good there. Will try out the other suggestions for comparison… I can’t imagine a better sandwich than the one Hong Kong does! NYT had an article on the best Bahn Mi places around the country. I’ve now been to dour of them, 3 in the south. Quoc going in ATL is delicious. I like the crispy bread, and the BBQ pork is better than Lee’s bakery. Dong Phoung in NOLA is the best Bahn Mi I have had, period. The meat there is super tasty, I had the BBQ pork and the Chinese sausage. Pork there was amazing. I’m at Lee’s sandwiches in San Jose, CA, and both Qouc Houng and Dong Phoung are better. any good place in Tampa area? Fyi, Atlanta’s Quoc Huong gets their bread from Lee’s Bakery, lol. I would go to Boston Bakery & Cafe if you’re in Orlando, FL. Def the best bahn mi there. I hear Saigon Deli in Tampa is pretty good. Saigon Noodle House (http://saigonnoodlehouse.wordpress.com) in Birmingham certainly has amazing bahn mi sandwiches, along with a sundry of other wonderful eats. Their Boba Smoothies (Pearl Smoothies) are also quite tasty, especially during the hotter months. I developed this website so that people can call in to order take out, but also to get a good idea of what is on the menu as well. I would have to say that Saigon Noodle House is heads above Pho Que Huong in Homewood. There is another one in Hoover called Pho Hoang (http://www.yelp.com/biz/pho-hoang-hoover) but I haven’t yet had a change to try it. Of course my favorite is a “Cajun Banh Mi” from Boo Koo BBQ in New Orleans, it has the tradtional vietnamese veggies and bread but is stuffed with cajun boudin, hogs head cheese and smoked pulled pork with a sweet chilie sriracha aoli…YUM!!! Dong Phong is very good, I agree. Pho Nola on Transcontinental in Metairie is also very good. Their mayo mixture was quite tasty. Zen Forrest in New Port Richey Florida has a great one! Pho Fusion in Asheville is the only place I know in town – they are delicious, and has encouraged me now to make my own! On Facebook, Jason Canonici passed on the recommendation of Le Bakery in Biloxi, Mississippi. What a place this is! Located at 280 Oak St in Biloxi, MS, this place may be one of the best kept secrets on the Gulf Coast. Besides being a top notch bakery, featuring MANY types of artisinal breads and pastries, they also have AWESOME banh mi. They are now doing cakes for all occasions as well. You can check them out on Facebook….. Please check out Pho Fusion in the Downtown Market in Asheville, NC for banh mi & yummy pho as well…we just discovered it the other day, and it’s delicious! It has to be the only Vietnamese restaurant in WNC, and I’m so worried it won’t stay in business because you’d never know it was there if you weren’t looking for it. It’s owned by a very sweet Vietnamese family, please support them! anyone know of any good places in or near Boca Raton? Jacksonville, FL has an amazingly good Vietnamese Restaurant called PK Noodles, located east of Beach Blvd/9a. Although everything I’ve tried there is top notch, the Shrimp Banh Mi is incredible! At the risk of shameless self-promotion, I’ve been trying out and commenting extensively on every bánh mì I can find in Louisville, KY on my review blog. Huy’s in Norcross Ga has the best bahn mi in Ga. All their bread is baked in house, they don’t offer BBq but their grilled bbq is as delicious if not more so. The kicker? They have these crispy fried onion strings/scallions that they add in to the sandwich that makes it amaaaaazing. Just ate yesterday at the Yum-Mi Sandwiches on 1227 N. Mills in Orlando, FL. Very Nice! In addition to Banh Mi they have fruit smoothies and boba tea. Had “Chicken in the Hay” which is lemongrass chicken. Looking for a place in and ariound Palm Beach Florida??? If you’re in NASHVILLE, TN check out KIEN GIANG off of Charlotte Pike! The BEST Banh Mi Thit Nuong:) You’ll find yourself in a mess of Vietnamese restaurants – each with their own specialty – but for the Banh Mi, it’s gotta be Kien Giang. And at $2.75 a sandwich, why not have a few? In St.Pete, Seasons Bakery & Thuy’s Cafe are good for boba, banh mi, & rice. I’ve sampled nearly every Banh Mi in New Orleans/West Bank– hands down, the trophy goes to Pho Hoa (1308 Manhattan Blvd in Harvey). Though they only list one sandwich on the menu, they will happily make others (Chargrilled Pork or Beef, or Sautéed Shrimp). The Chargrilled Pork is the best in the city (Pho Nola is a close second). Whether you’re a first-timer or a well-seasoned Banh Mi connoisseur, Mama Fu’s is the perfect stop for your fix of the classic Vietnamese sandwich! Each sandwich is made to-order with fresh-toasted French Rolls, tangy pickled carrots & radish, spicy sauce, and a choice of Chicken, Beef, Shrimp, or Tofu. Plus, every sandwich comes with hot, crispy Sweet Potato Fries – the perfect meal when dining in or on-the-run! Whether you’re looking for a quick and tasty lunch during your work day or need to grab a meal to-go on your way to the beach, Mama Fu’s Banh Mi Vietnamese sandwich is the answer! ATLANTA, GA – My first experience with Banh Mi was at a little coffee shop at the corner 17th and Peachtree on the first floor of the EarthLink bldg. Lattetude (obligatory cute coffee shop name) is primarily a straight forward coffee place with light pastries and sandwiches, but I’ve been hooked on their Banh Mi recently. The pork are great and they also offer tofu and chicken which I have yet to try. People rave about KT’s Deli in Venice, Fl. This is a new banh mi place opening up in Charleston, South Carolina from the guys that brought you Street Hero at the Charleston Farmer’s Market. Check out this great article on them. The place is scheduled to open in Late July 2012. We have been to Dong Phuong in New Orleans and it was good but Golden Palace in Pensacola has them beat. They do all the stuff up right – and cheap too! WE SUKI SUKI! Its in Alanta GA in the heart of the East Atlanta Village on Flat Shoals Ave. A woman by the name of “Q” opened up her shop about a year back and she serves THE best banh mi I’ve ever had! Pho Vietnam vietnamese restaurant serve wonderful Bahn Mi sandwiches. I hear pho is good too, but I love bahn mi too much to try. Located on Rogers Avenue across from Mr. Rob’. Lime and Basil on franklin street in chapel hill has great banh mi sandwiches and they are only $5 at lunchtime. Just opened and the Banh Mi is delicious! I have to say this little spot is paradise. Get the Five Spice Pork or Red Curry Beef…or both. you can’t go wrong. This place needs to expand so get on your pony and ride up to Bon Bahn Mi on Spring Street in Charleston, SC! Dalat in downtown Raleigh. It’s on Western Blvd. They are fabulous! Star Provisions in Atlanta (2 blocks from IKEA) has the best Bahn Mi I have ever had. The meat was beautifully flavored and all of the components were superb. It is the single best sandwich I’ve ever enjoyed. Pho & Com – Roswell, GA. Owned by two of the sweetest people you’ll ever meet and their food is outstanding. They have several Banh Mi sandwiches including a scrambled egg one which is awesome. Cheap, great food in a funky location but well worth seeking out. Awesome pho too. Athens GA. Yummy Pho downtown and Just Pho… and More on Baxter both have tasty Bahn Mi. Eat Well! in their case, it only costs $6 to go to Heaven and that includes a drink. Montgomery Alabama. VN Pho. Bell Road. Log in | 99 queries. 0.678 seconds.